In District Heights, Md. 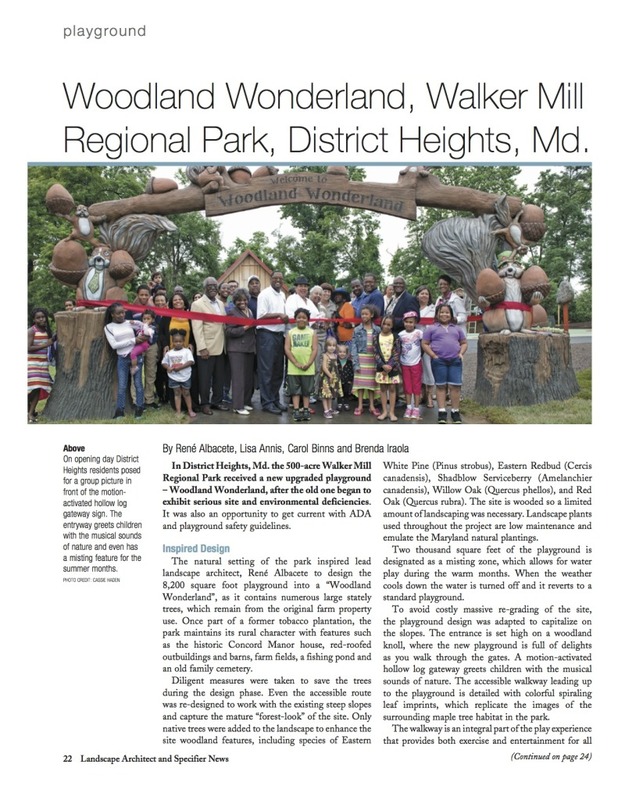 the 500-acre Walker Mill Regional Park received a new upgraded playground – Woodland Wonderland, after the old one began to exhibit serious site and environmental deficiencies. It was also an opportunity to get current with ADA and playground safety guidelines. The natural setting of the park inspired lead landscape architect, René Albacete to design the 8,200 square foot playground into a “Woodland Wonderland”, as it contains numerous large stately trees, which remain from the original farm property use. Once part of a former tobacco plantation, the park maintains its rural character with features such as the historic Concord Manor house, red-roofed outbuildings and barns, farm fields, a fishing pond and an old family cemetery. White Pine (Pinus strobus), Eastern Redbud (Cercis canadensis), Shadblow Serviceberry (Amelanchier canadensis), Willow Oak (Quercus phellos), and Red Oak (Quercus rubra). The site is wooded so a limited amount of landscaping was necessary. Landscape plants used throughout the project are low maintenance and emulate the Maryland natural plantings. Two thousand square feet of the playground is designated as a misting zone, which allows for water play during the warm months. When the weather cools down the water is turned off and it reverts to a standard playground. To avoid costly massive re-grading of the site, the playground design was adapted to capitalize on the slopes. The entrance is set high on a woodland knoll, where the new playground is full of delights as you walk through the gates. A motion-activated hollow log gateway greets children with the musical sounds of nature. The accessible walkway leading up to the playground is detailed with colorful spiraling leaf imprints, which replicate the images of the surrounding maple tree habitat in the park. 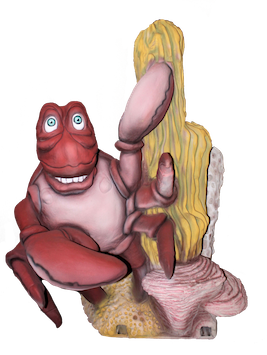 The walkway is an integral part of the play experience that provides both exercise and entertainment for all visitors in the form of a joking gnome, crawling critters, rabbit talk tubes, a Rastafarian frog drum, and even an abacus, and hints at the anticipated surprises that will meet them at the top of the hill. 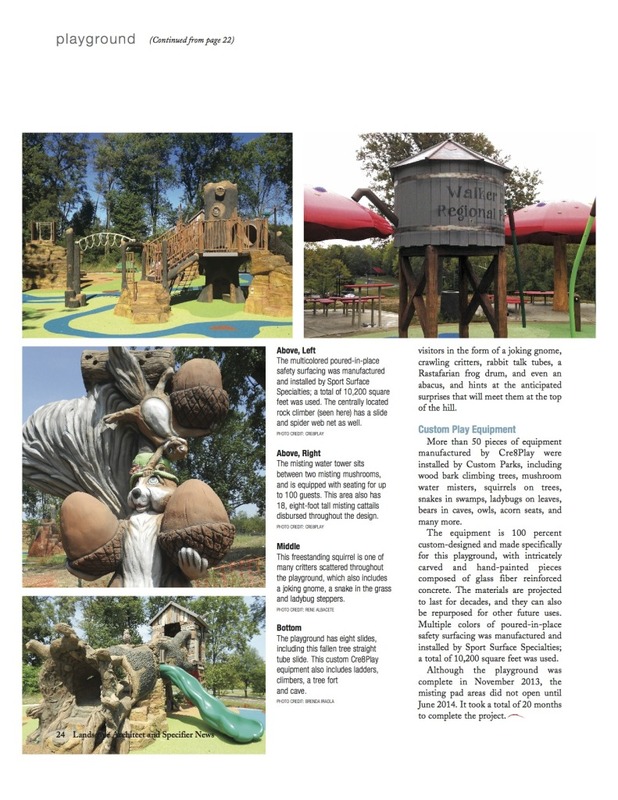 More than 50 pieces of equipment manufactured by Cre8Play were installed by Custom Parks, including wood bark climbing trees, mushroom water misters, squirrels on trees, snakes in swamps, ladybugs on leaves, bears in caves, owls, acorn seats, and many more. The equipment is 100 percent custom-designed and made specifically for this playground, with intricately carved and hand-painted pieces composed of glass fiber reinforced concrete. The materials are projected to last for decades, and they can also be repurposed for other future uses. Multiple colors of poured-in-place safety surfacing was manufactured and installed by Sport Surface Specialties; a total of 10,200 square feet was used. Although the playground was complete in November 2013, the misting pad areas did not open until June 2014. It took a total of 20 months to complete the project. View article at Landscape Architect and Specifier News’ digital magazine.